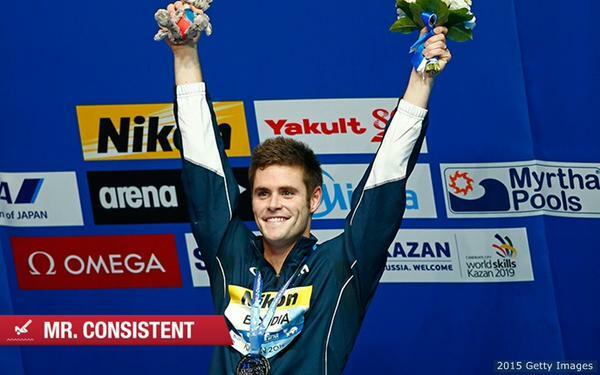 David Boudia was honored as USA Diving’s Athlete of the Year award for the sixth consecutive year and seventh time in his career. Boudia won the silver medal on 10-meter at the FINA World Championships earlier this year. He also won silver on the event at the 2011 and 2013 World Championships, and with his 2015 silver, Boudia became the first American diver to medal on 10-meter in three consecutive World Championships since Greg Louganis won gold in 1978, 1982 and 1986. Boudia also competed with Steele Johnson in synchronized 10-meter at the World Championships, with the duo finishing fifth. Earlier in the year, Boudia won an individual bronze at a FINA World Series meet in Beijing, and he and Johnson won silver in synchro at a World Series competition in Windsor, Ontario. On Wednesday, Boudia and Johnson won the 10-meter synchro title at the Winter Nationals.